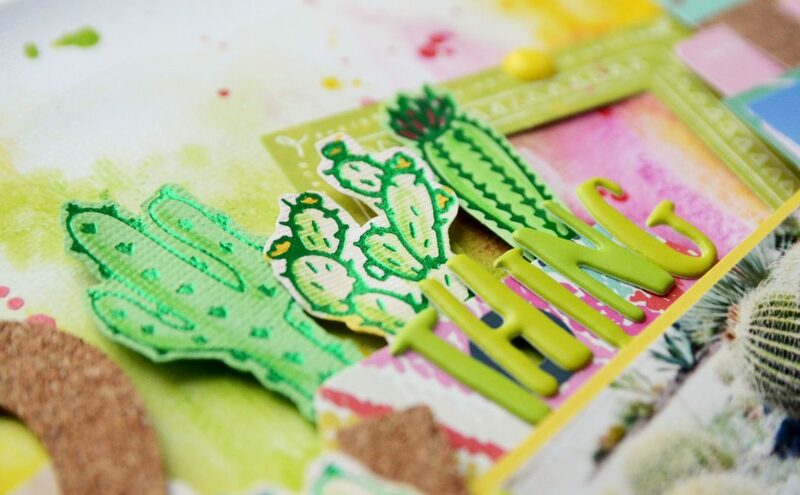 Hello Spellbinders friends. My name is Anna Komenda and I am over the moon happy to be back as a Guest Designer for this wonderful company. This time I had a great pleasure to work with new Glimmer Hot Foil System. To say I am in love with it is not enough. Quality of foiling with this machine is fantastic and foiled elements look so professional. 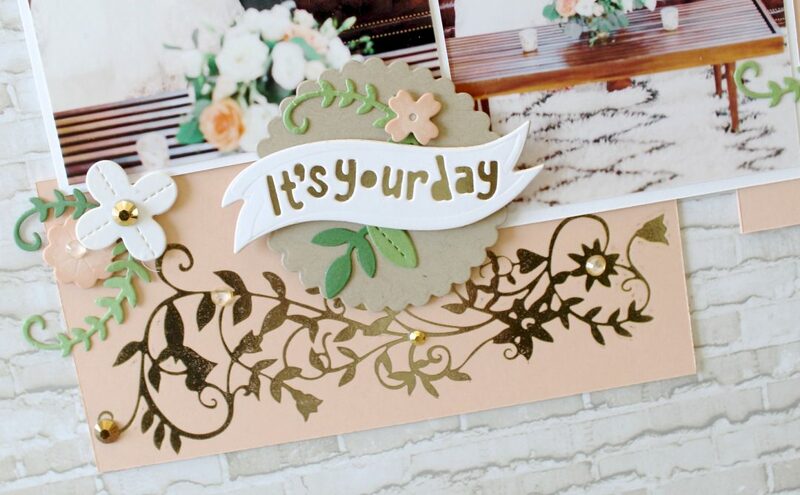 I wouldn’t be myself if I wouldn’t try to incorporate foiling into the layout. When it comes to this machine there is no limitation on the size of the paper you want to add foiling on. 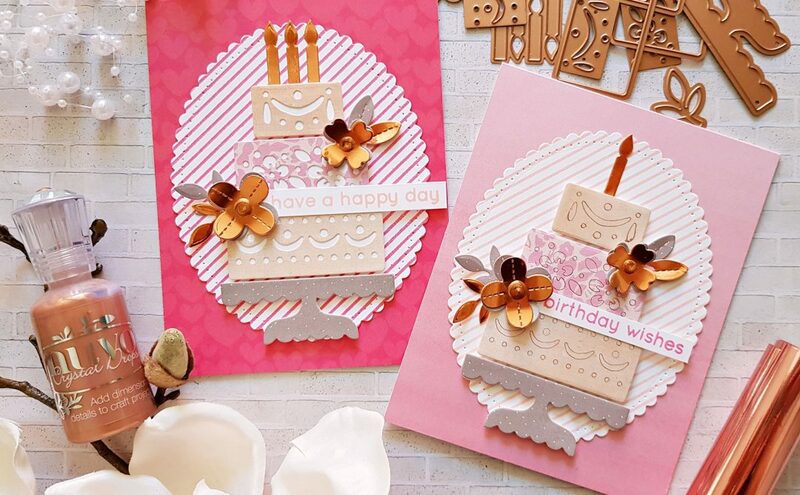 However, the size of your die cutting machine can limit you as you need both to complete foiling. I only own Spellbinders Platinum 6 so I can’t run through it any papers wider than 6 inches. That’s why I thought that I can fussy cut foiled elements and use them as ephemeras on my page. 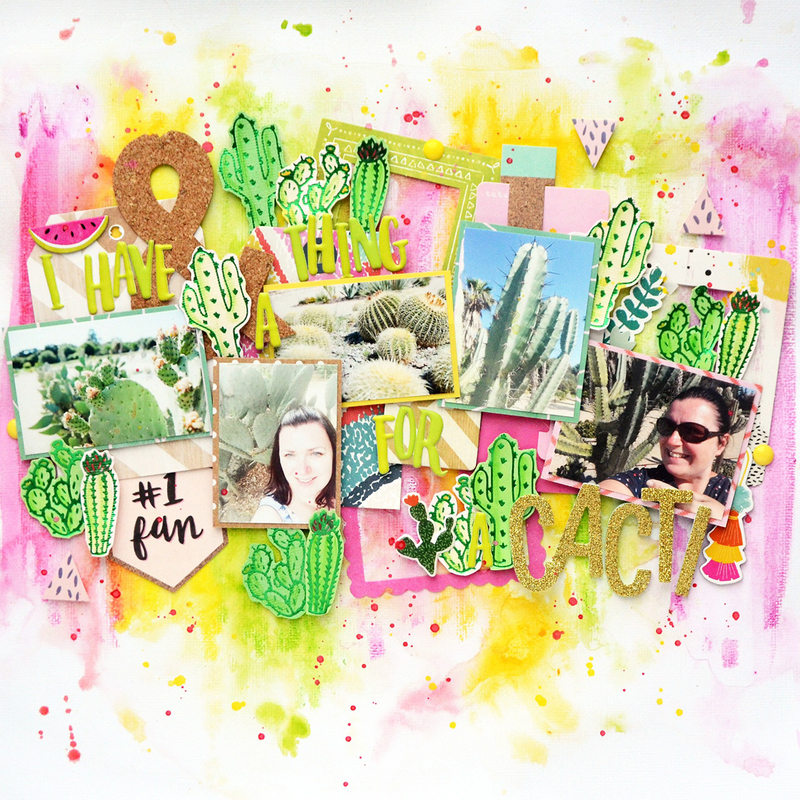 Now, once you’ve seen my page, you know I am a cacti fan. I was so happy to see that one of the plates, that works with Glimmer Hot Foil System had three cacti in the design. It’s called „Lookin’ sharp” and it was perfect for the project I had in mind for a while. 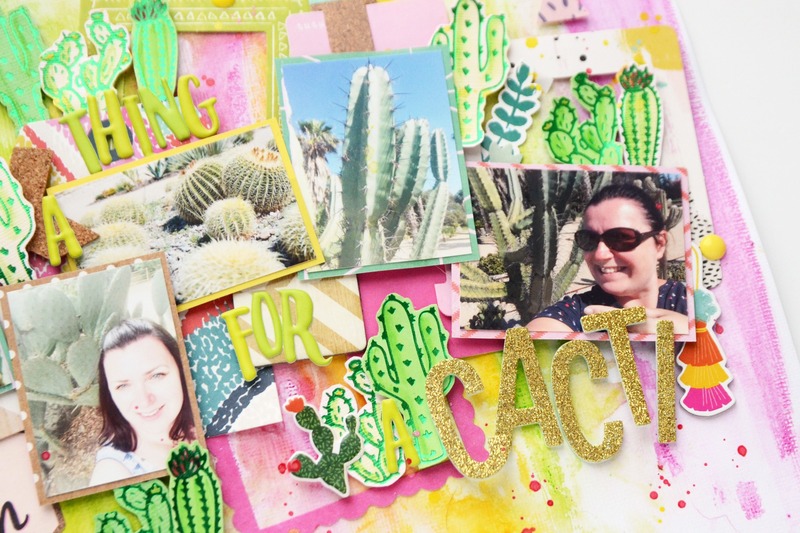 I started with foiling many cacti using both green and pink cardstock. If you are using the one with texture, remember to add some extra sheet of paper to your sandwich in die cutting machine. 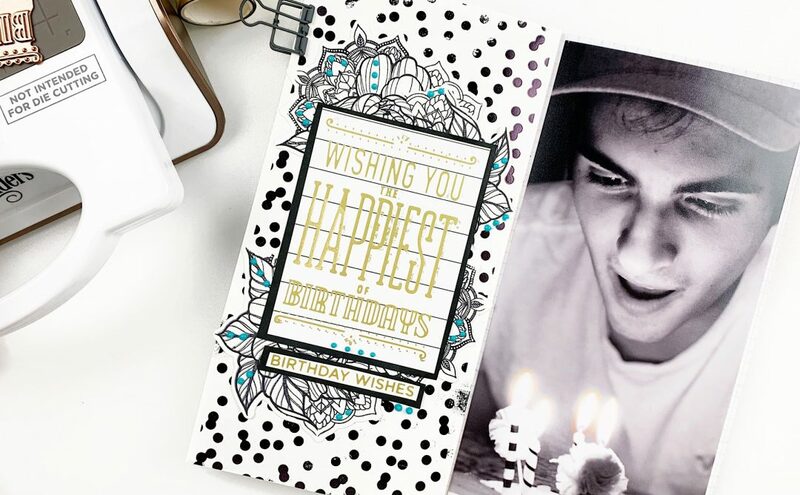 It will help the foil to reach all the tiny holes in paper. 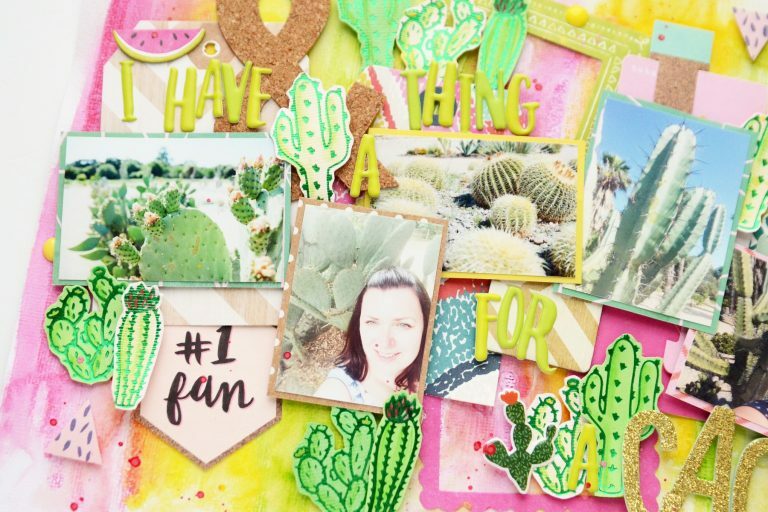 I wanted to make a very colorful page, so I reached for mixed media products, to create my background. I recorded in all on the video, so you can easily follow my process. You will find the link to the video at the end of this post. Foil is mixed media resist so it can be an awesome product to use with inks and paints. You can easily remove all the leftover liquid from the surface of foil. 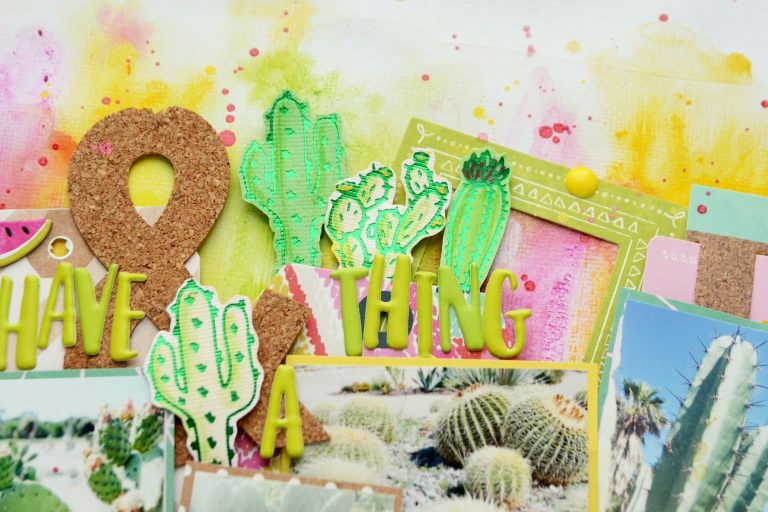 American Crafts white cardstock, papers Crate Paper „Good vibes” collection, ephemera pieces Crate Paper „Good vibes”, clear gesso Prima, Distress Crayons Set 1, green puffy alpha stickers Hip Kit Club, gold glitter Thickers Amercian Crafts.